From the start, this production surprised me. Science fiction is a difficult genre to produce well on stage, being more well suited to books and film. Yet the play surpassed my expectation of being slightly entertaining, and instead inspired an intellectual examination beyond what I believed I would encounter. The title “Uncanny Valley” is extremely apt and echoes the depth of the play. “Uncanny Valley” is a term that references that uneasy feeling people encounter when faced with humanoid machines—the recognition that something is not quite as realistic as an actual person. Placed in an intimate setting that was straight out of a classic 80’s sci-fi film set in the future, I could tell that the setting was much less significant to the play than the writing and acting would be. I was impressed with the use of space to create a dynamic enough setting that the audience would not feel the absence of a much larger stage. It was an office, simple yet effective for the actors, and the proximity of the audience added to the experience. The actors themselves had a great deal to do with the success of the play. The superb writing and the flawless portrayal the actors produced was evident immediately. 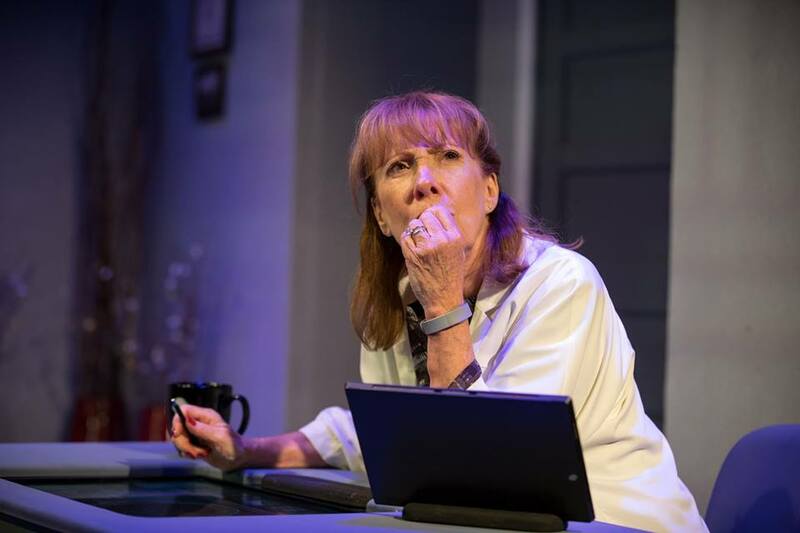 Using humor to hook the audience, the first scene grabs the viewers and places them down directly in the office of Claire (Anne Myers), a scientist working on the newest version of Artificial Intelligence. The robot was quite comical, and excellently portrayed. Not once did I see a slip of the robotic mask that held this character in time and place. The doctor was the audience’s connection to the machine. 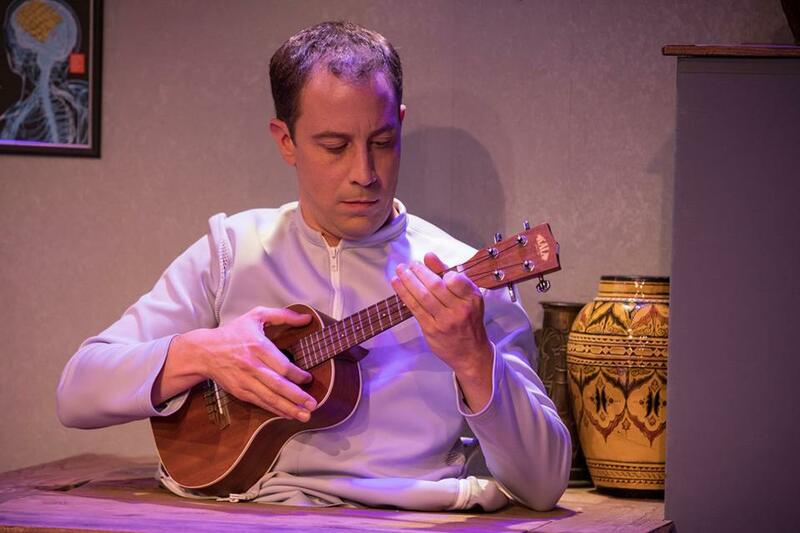 The character of Claire played off Julien (Neil Truglio), and the two became a human and machine duo quite unique to stage theater. The plot was quite easy to follow, as Julien began navigating human imitation and interaction, and more was revealed about Claire, adding more depth and substance to her character. I believe it is human nature to care for beings, and the same is true for Julien. The audience immediately begins to feel for this odd humanoid machine, but the plot itself goes much further in exploring the moral and scientific definitions of human and life in general. Cleverly depicted and very intellectually stimulating, this play focuses on what defines humanity, and most of all identity. Julien’s identity as merely an artificial intelligence morphs subtly from one scene to the next, and slowly he gains an identity as “Julian”. This identity suddenly snaps, as he is downloaded with memories and personality of a human man who is terminally ill. Who does he become? Is he still Julian, but with the understanding of a human man who once lived? Or did whatever defined Julian disappear when the other identity was placed in his consciousness? Somehow, the writer, Thomas Gibbons, manages to write as character that has transformed into both. Merging identities clearly isn’t as seamless as you would believe—a machine should work within specific parameters, defined by code, should it not? But Julian is now both human and machine, and even more questions emerge because of this. Is identity definitive of life, of “someone”? Does that someone required to have an organic, naturally formed body, or can machines in their lifelike state become “someone”? Is it even morally acceptable to create such a thing to begin with? All in all, this play was fantastic. The writing was witty, deep, and inspired critical thinking. 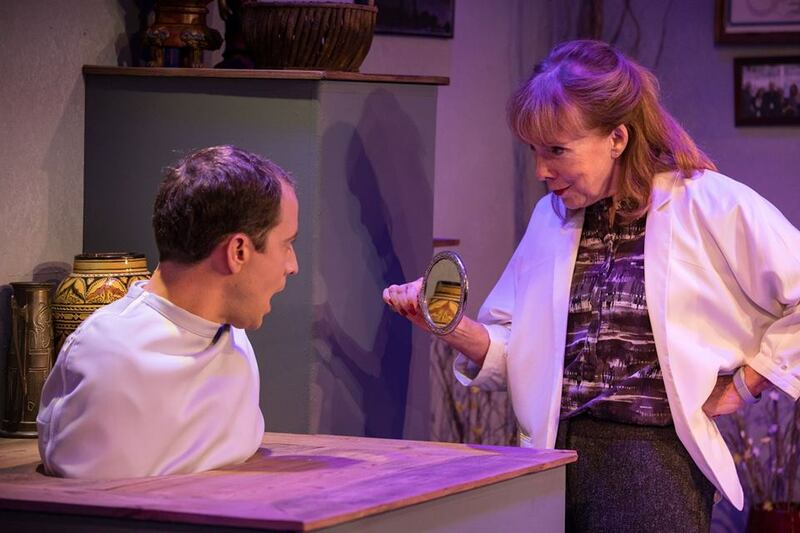 Rachel Rogers wonderfully directed and produced a very stimulating and entertaining play, along with a wonderful team. I would highly suggest attending, especially because of the venue. Benchmark theater has the city vibe but maintains the eclecticism of the arts District. This play gives more than entertainment—it truly asks the audience to think about our scientific strides, and what creates our identities. 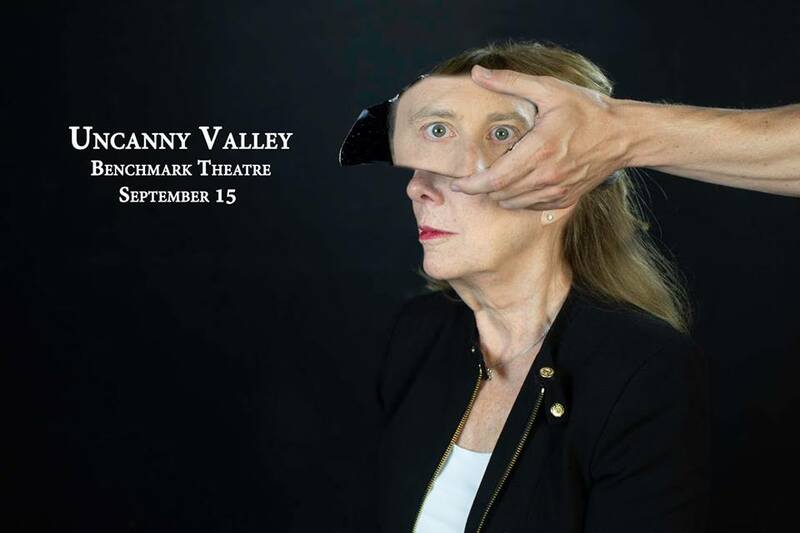 UNCANNY VALLEY continues now through Saturday, October 13th with performances Friday – Saturday evenings at 8pm and Sunday evenings at 6pm. The production will take place at the company’s new home in the 40West Arts District in Lakewood at 1560 Teller Street. Please visit www.benchmarktheatre.com to purchase tickets and send any inquiries to info@benchmarktheatre.com.